During an appearance at a Heatherlands home north of Hailey, Democratic congressional candidate Nicole LeFavour laid out campaign goals that she hopes will win Idaho's 2nd District seat in Congress from Republican Rep. Mike Simpson. She said her plans include restoring jobs lost to state budget cuts, eliminating Bush-era tax cuts to reduce the deficit by $1.2 trillion and promoting a decentralized energy policy that would take greater advantage of Idaho's sustainable energy resources. "State budget cuts have eliminated 2,000 jobs," LeFavour said. "Those people are now on unemployment benefits instead of working. The Republicans believe that as long as the economy stays in bad shape, Obama won't win. They are playing politics with people's lives." LaFavour said many food processing facilities in the state have been "mothballed" by companies that would rather ship raw produce out of state, including one in Glenns Ferry that until recently kept 300 people employed. "We used to process things in Idaho. Now you can see all the beans and potatoes going out of the state on trains," she said. LeFavour, a teacher, writer and field biologist, served four years as a state representative and four more in the state Senate before taking aim at the national office. She said to a crowd of about 50 people, including state Sen. Michelle Stennett and state Rep. Wendy Jaquet, both Democrats, that she has been encouraged by the amount of funding her campaign has raised four months prior to the election. "We [Idaho Democrats] have put forward candidates again and again to beat Mike Simpson, but not candidates who take fundraising seriously," she said. LeFavour described Simpson as one of the seven "architects of the obstructionist Congress" for having gotten Rep. John Boehner, R-Ohio, elected as speaker of the House. LeFavour said that as of Wednesday she had raised $141,000 toward a goal of $180,000 by Saturday, a benchmark set by national Democratic Party consultants. LeFavour hopes two small-scale fundraising concerts scheduled for this summer featuring Carole King, one of her major campaign supporters, will give her the push she needs to get her ideas across to Idaho voters. "We only need 20,000 new voters to win this race," she said. "We need women, Latinos, young people, gay people." 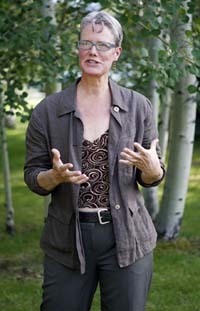 LeFavour is the only openly lesbian politician in Idaho. She said a recent bill sponsored by Sen. Chuck Winder, R-Boise, that would have required women to undergo an ultrasound examination before terminating a pregnancy may have helped her cause. "It was a perfect bill, because it was such an affront to women, and because it failed," she said. Winder, an anti-abortion advocate, said he would reintroduce the bill next year. LeFavour said she favors working across the aisle to get things done as a legislator. She has introduced or co-sponsored legislation to expand mental-health services and teen substance abuse counseling, and has fought cuts to education budgets. Earlier this year, she supported a bill that would have protected gay people from basic forms of discrimination in areas of education, employment, public services and real estate transactions. The bill was killed in the Senate State Affairs Committee. "The vote went down pretty much along party lines," LeFavour said. "I don't think a lot of people know that gay people can lose jobs, be turned away from housing or lose educational opportunities in Idaho," she said. The campaign event was hosted by homeowners Char Roth and Bruce Tidwell.